Autopsy is a small flip book that contains nothing but diagrams for two Montenegrin stitch forms, showing the order and logic of the individual stitches. How tough can that be? Plenty tough. What the book lays out is the stitch sequence for EVERY junction where horizontal, vertical and diagonals meet. As you can see from my piece, there are lots of junctions possible! This is a boutique item to be sure – not everyone leaps in and rolls around in this particular stitch style, but if you are planning a project using it, the book is well worth its its price. It’s no secret that I’m nearing completion of my own book. I’ve got about 60 plates of patterns done. 58 of them are complete. I may or may not expand that to 62 for publication. I have to make some decisions on some out-takes and patterns that span multiple pages. I have the companion “about” pages written. I’ve got the bibliography done. I’m working on the introduction now. And as I do so, I’ll be posting related bits to String. I can’t include museum photos in the book without licensing them. But I can use links to those photos here. Much of this material is stuff I covered in my Schola lecture. But instead of running through the travelogue of styles and techniques, I want to start with the fun part. The “Long Lost Twins” examples. The counted thread styles I’ve been working for the past three years are quite well represented in museums worldwide, largely thanks to those interested in historical embroidery between 1870 and World War II. This is the era that included both Freida Lipperheide whose pattern collection documented specific artifacts (published in 1880s), Louisa Pesel (a leading needlework researcher most active from around 1900 until her death in 1947), and Arthur Lotz who cataloged all extant modelbooks (published in 1933). There were countless other books on old lace and needlework, and collectors ranged all over Europe harvesting examples. Many of these collectors amassed impressive assemblages of artifacts, and their collections form the backbone of what’s available for view at the Metropolitan Museum of Art in New York, the Boston Museum of Fine Arts, the Hermitage in St. Petersberg, the Philadelphia Museum of Art and others. We owe a lot to their diligence and enthusiasm. However the collectors were rather more of the Indiana Jones school than we as modern stitching devotees would like. The pieces are not clearly associated with provenance or date. Often they are small snippets disassociated from the original integral artifact, so the exact nature of the item they adorned is open to discussion, and center strips that might have been used in combo with additional narrow edgings have been cut and removed from context. Styles and patterns were also relatively conservative, appearing over long spans of time. Unlike samplers which have an increasingly wide body of academic research documenting them, these (mostly) domestic embroideries have drawn lesser attention, probably because they are anonymous and problematic to date. I don’t claim to be an academic. I’m just a dilettante. But I can observe. And this series contains some of my observations. But enough dry disclaimer. Here’s our first example of fun. The image on the left is Valence Embroidered with a Grotesque Motif, now in the Hermitage Museum. They date it as 16th century, from Italy. It’s stitched in red silk on linen, with a pulled thread background to achieve a mesh like effect and double running stitch for the outlines and details. The whole piece is about 5×29 inches or 13x75cm, unclear if that’s with our without the fringe, or whether the photo shows the entire artifact. The Hermitage obtained this piece in 1923. The item on the right is Border, Accession 14.134.16a in the Metropolitan Museum of Art. They date it as a 17th century Italian work. I’ve only shown one repeat, but the whole two+ repeat artifact is shown on the museum photo. It’s 6.14 x 24.5 inches or 15.9 x 62.2 cm. It was acquired in 1914. You have to admit, they’re pretty darned close. If anything the later work has a bit more detail than the earlier one (although the earlier piece shows more diligence in filling in the more difficult tiny background bits inside small diameter swirls. This usually not the way the generation to generation transcription of patterns works. Detail is usually lost, with chubby Renaissance cherubs devolving into the minimalist “boxers” on 17th century samplers. To date I have not seen this pattern in a period pattern book. As to the iconography, the pelican vulning itself (pricking its breast to produce blood to feed its young) is a standard image of the time. The obvious allegory is self-sacrifice. The other two winged creatures are rather sphinx like to me – wings and feathers, heads of women, lion bodies. They appear to be either blowing pan-pipes or sipping on flowers, depending on which piece you are looking at. The well or giant urn and vegetative components are very standard. Large urns flanked by facing beasts or mythical figures are very common in weaving and other decorative arts of the 1500s and 1600s. So what I end up with is a piece extolling virtues of self-sacrifice and wisdom, with a vaguely feminine cast. Now, why are these so close? I haven’t a clue. I do not know if work of this type was done at home by talented amateurs, or in workshops. The skill level to create these is relatively high by modern cross-stitch kit standards, but in truth it’s not all that difficult, and the majority of today’s dedicated counted thread stitchers would have minimal trouble achieving it. 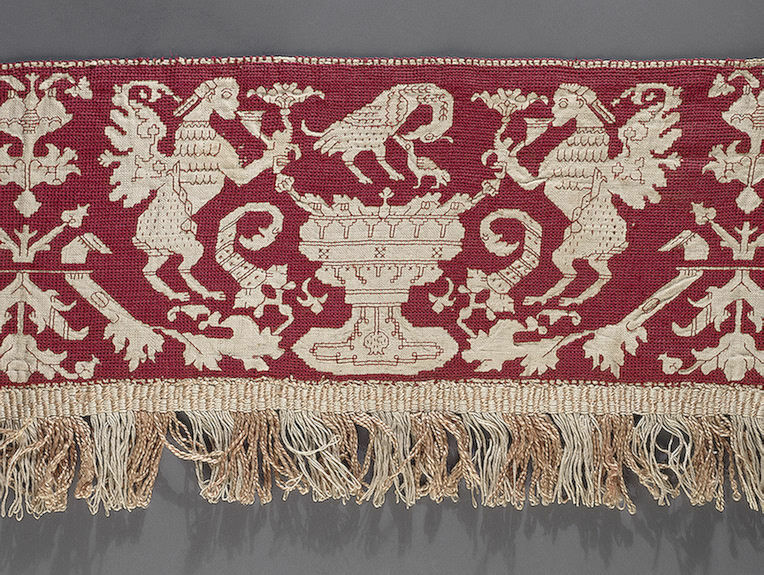 I have no doubt at all that non-professionals in the 1500s could have churned out this work in quantities sufficient to edge bed hangings, sheets, curtains, towels, or pillows. About all I can say is that they are not from the same original. There are enough minute differences between them both in pattern details and the way they were stitched to preclude them being from a matching set. I also have no choice other than to rely on the museum’s dates. And so we see the weaknesses of the attributions inherited by the museums from the original collectors. Are they in fact close in date with one being rather late 1500s and the other being rather early 1600s? Are they contemporary, from one century or the other? No way for me to tell. What were they originally used for? Again, these pieces are out of context. We don’t know. The Hermitage pegs theirs as being part of a valence, probably based on the presence of the fringe along the lower edge. Was this part of a bed suite? A good guess, but without pieces or fragments of the rest of the suite, there’s no way to tell. The Met’s sample is even harder to place for use. It’s been totally removed from its origins. If it had accompanying top and bottom borders (very common), or a fringe like the Hermitage piece, they’re long gone. So what we have are two pieces officially dated up to 100 years apart, recognizably highly similar in design, worked in very similar materials and techniques, from the same general geographic area. The later one displays slightly more detail than the earlier example. We’ve got no unifying source of pattern that link them. 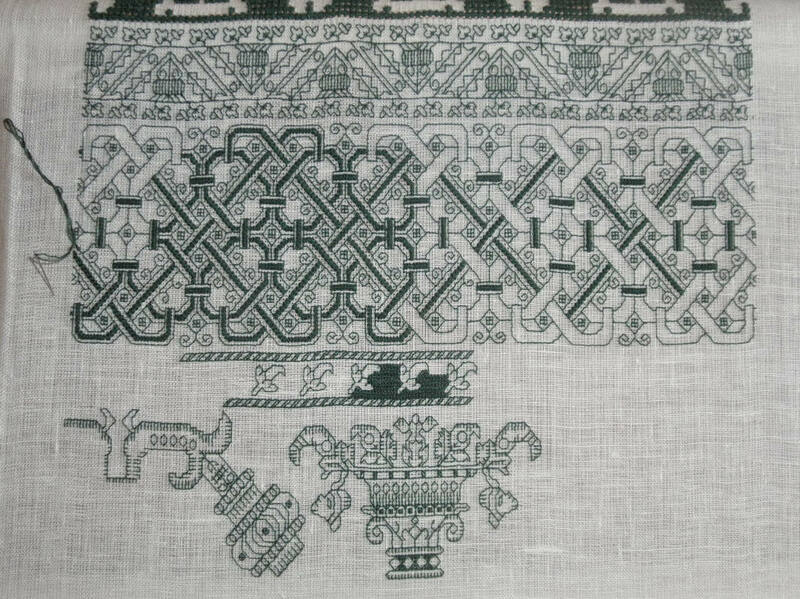 My only conclusions are that these prove that patterns were re-used; that they were relatively conservative over time AS IF the workers were stitching from common source material either printed or stitched. I’d also say that small variations work to work validate similarly small deviations performed by modern stitchers wishing to replicate the style and design, but that’s just my own personal opinion. I have lots more of these. Stay tuned! The montenegrin stitch is one that has always kinda intimidated me. That book looks like one I need to get as it shows how to do angles and corners. That is one problem with alot of the more complicated stitches that I have seen, they show you how to go in a straight line but don’t tell you how to do angles or vertical. I love the pattern that you have shown us here and looks pretty complicated to graph. It is kinda funny because I look at stuff like that and drool when imagining a room done with that kinda of work throughout. Thanks so much, this was a great post! Looking forward to more! Would you consider putting instructions for the silk wrapped, pulled thread mesh back ground in your book (or if those kinds of instructions are not planned perhaps as a tutorial online)? I do so love the look of it. The example on the left shows what I assumed was a solidly worked long armed cross stitch background to fill in. Your research is giving me a new way to look at things. Oh, to have your eyes! I tend to think of these female mythological creatures as harpies–although I’m sure there is a better term.